Over the past two days I was on a mission to finish the Scrapbooksteals Jade Series. I thought I only had two layouts left to complete... but I forgot about this weeks sketch. By some miracle I finished this sketch in one hour... and its a little wild... its also not as close to the sketch as most would be but it is 100% inspired by it. Lately I have been using a lot of doodling and stamping on my layouts. So, I made a point to stamp on this layout to play along with my local scrapbooking store's weekly challenge. You have until Sunday coming to play along! It's important to see the my final layout to look like the sketch. I started out wanting to do my "letters to Santa" layout - the pictures were sitting there along with the transparency. Quickly I played around with different background colors to help the transparency pop. I landed with Basic Grey Basics lined paper... which plays perfectly with my theme of "letters". I thought I would write my journalling directly on the page using the lines, as well as note the date in the right hand corner as if I were writing a journal entry. Next I looked again at the sketch and figured my transparency wasn't quite going to work as the "heart" shape. I grabbed my pen and started drawing circles with my American Crafts precision pen. I figured that if I messed up I would grab another sheet from the pack. Loved it. I then played around with the photos and turned the sketch. Perfect. Next I added two shades of Mister Hueys (Plum Thumb and Peppermint) specks. I grabbed some more grey patterned paper and a doily and some pop dots... I then envisioned the journalling but I wanted the journalling to pop. So, I grabbed my gesso (as Ana-Marie Wolniak would..) and painted some white on the page... Nope. That didn't pop enough. Since Plum Thumb was sitting on my desk, I dropped a couple drops and out came a pinky red. I loosely applied that and set it with my heat tool. Finally I grabbed my new Stampin Up Sent with Love stamp set (which I have used on two layouts in 24 hours) and stamped away along with some thickers. Cool, hey? Supplies used: Glitz transparency, BG basics paper, Stampin Up sent with love stamp set, Stampin Up "Oh Hello" stamp set, Mister Huey's, American Craft precision pens black & brown), acrylic gesso, Simple Stories Documented paper, Simple Stories Handmade holidays tiny type stickers, and Stampin' Up doily. Next I have the week 5 mojo series - This is a two page layout, in which I decided to tackle Christmas morning. I despise doing holidays but they mean so much to me because often its family I don't always get to see. However there's always too many pictures and just too much that I want to capture. 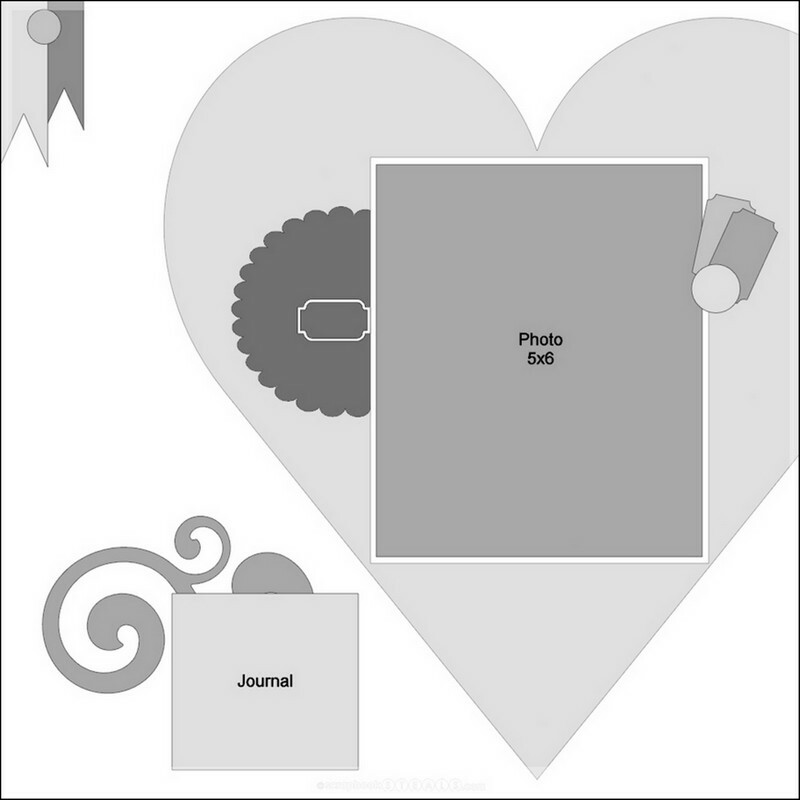 This layout has a hidden journal tag (see the heart flag) which explains the "goings-on". I changed up the sketch a little as I wanted my pictures to touch. Instead of my pictures going up and down I used tags. Supplies Used: BG nordic holiday paper & stickers, Simple Stories Handmade Holidays paper, stickers and paper pads, Simple Stories Summer fresh paper, BG chipboard stickers, Simple Stories year-o-graphy paper, and Studio Calico badges. Supplies Used: Bell Blvd Baby Boy collections, October Afternoon Midway washi, Doodlebug Loopy Love letters, AC precision pen, Shopevalicious.com v2 badge, Stampin Up sent with love stamp set, Freckled fawn wooden veneers, Stampin Up pool party ink, Studio Calico vellum shapes, Little Yellow Bicycle paper crafting kit, Carta Bella Traditions & Winter Fun stickers, MME enamel dos, Freckled Fawn washi, Bella Blvd washi and FancyPants Blissflul Blizzard stickers. Here's some close ups - lovin' those enamel dots and vellum shapes! I am finishing up a mini album for my in-laws and will post my tea items soon. Lots of things on the go!! Would love to show you a sneak peek of my "twinchies" but I think it will give too much away.